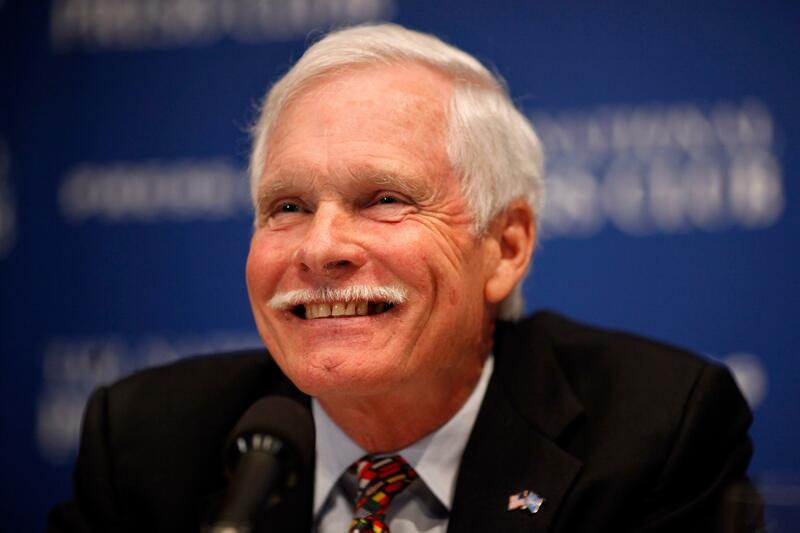 Ted Turner is a U.S media mogul popular for founding the first 24-hour cable news channel, Cable News Network (CNN). Besides CNN, Turner also founded WTBS, which is the brain behind the superstation concept in cable television. The Ohio native is also a well-known philanthropist who gifted $1 billion to the United Nations in support of the establishment of the United Nations Foundation (a public charity created to broaden domestic support for the United Nations), for which he serves as the chairman of its board of directors. The media mogul was born in Cincinnati, Ohio on the 19th day of November 1938 to a billboard magnate Robert Edward Turner II and his wife Florence. When he was about 9 years old, his family relocated to Savannah, Georgia. He schooled at The McCallie School (a private boys’ preparatory school in Chattanooga, Tennessee). After high school, he headed to Brown University where he first majored in Classics and would later change to Economics which he subsequently bagged a degree in. Before Turner received his degree from the university, he was expelled for harboring a female student in his room. While at Brown, Ted Turner was the vice-president of the school’s debating union and the captain of the sailing team. He also identified as a member of the Kappa Sigma, an American collegiate social fraternity which began at the University of Virginia in 1869. In November 1989, he was awarded an honorary B.A. when he attended the National Association of College Broadcasters second annual conference. After Ted left the university, he returned to the South in the 1960s and began managing a branch of his father’s company in Macon, Georgia. Following his father’s death (suicide) in 1963, he took over as the president and chief executive of his father’s Advertising Company and turned it into a global enterprise. The business enjoyed monopoly in Columbus, Macon Savannah, and Charleston during the era of the Vietnam war emerging the largest outdoor advertising company in the Southeast at the time. In the late 1960s, Ted began investing in radio stations; buying a couple of them in the South. In 1969, he sold them off to buy WJRJ, Channel 17 – a struggling television station in Atlanta. At this time, private stations didn’t thrive quite well but Ted Turner believed this will change with time as people would desire more from their TV stations. To drive his optimism home, he changed the station’s sign to WTCG – an acronym for “Watch This Channel Grow”. Initially, they showed old movies from the 1930s, 40s, and 50s, as well as old sitcoms and theatrical cartoons. In 1973, the station acquired the rights to air the Atlanta Braves baseball games, later that year, Turner also purchased UHF Channel 36 WRET (now WCNC) in Charlotte, North Carolina and ran it with a format similar to that WTCG. By 1976, the FCC allowed the station to transmit content to local cable TV providers across the nation via a satellite. It was in that same year that Ted bought the Atlanta Hawks and Atlanta Braves with the aim of providing programming for WTCG. In 1979, Ted Turner together with Reese Schonfeld founded the first 24-hour cable news channel, Cable News Network (CNN). The following year, he sold WRET ( his North Carolina station), to fund the establishment of its headquarters in lower-cost, non-union Atlanta. Schonfeld served as the first president and chief executive of the station until 1982 when Turner took over after the two men had a dispute following Schonfeld’s firing of Sandi Freeman. Turner is also the owner of Brut Productions which he acquired from Faberge Inc in 1981. He also acquired MGM/UA Entertainment Co. in 1986 from Kirk Kerkorian for $1.5 billion after a failed attempt to purchase CBS. Kerkorian would later buy back the film studio; the Studio lot in Culver City was later sold to Lorimar/Telepictures but Ted Turner kept its pre-merger film and TV library. In 1986 also, Turner Entertainment Co. was established to oversee all film and TV properties he owes. His other venture includes Turner Network Television (TNT), Turner Classic Movies, among others. Ted Turner is a well-known philanthropist; who is constantly contributing to society as well as individual developments. He contributed $1 billion to the United Nations in support of the establishment of the United Nations Foundation (a public charity created to broaden domestic support for the United Nations), for which he serves as the chairman of its board of directors. In 2011, he partnered with former U.S senator Sam Nunn and founded the Nuclear Threat Initiative (NTI), a non-partisan organization which is dedicated to reducing global reliance on, as well as the prevention of the proliferation of nuclear, chemical, and biological weapons. Ted currently Co-Chairs the organization’s Board of Directors. Ted Turner is currently one of the richest men on the planet; his net worth as of 2019 is $2.2 billion which are earnings from his media establishments and other chains of businesses including the fifteen ranches he owns in Nebraska, Montana, Kansas, South Dakota, Oklahoma, and New Mexico. He is the owner of Vermejo Park Ranch, the largest privately owned ranches in New Mexico measuring 920 square miles (2,400 km2). 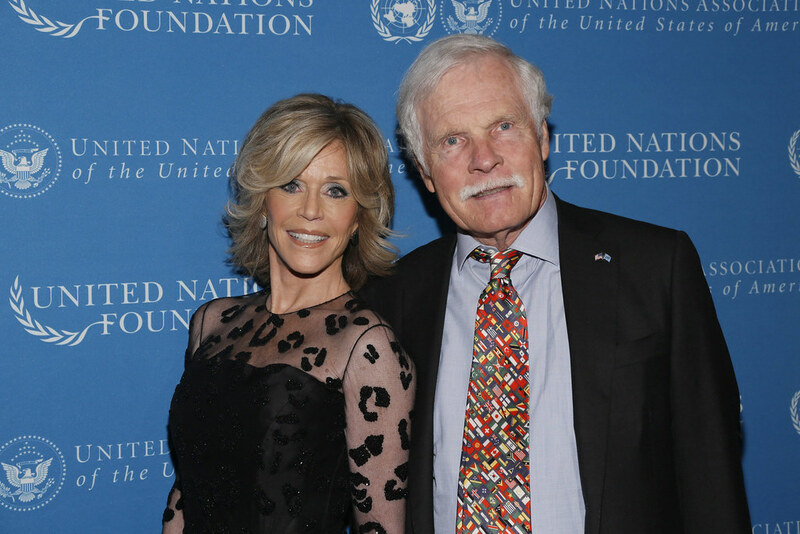 Ted Turner has been married thrice and they all ended in divorces. His first marriage was to Judy Nye and it lasted for just four years, 1960–64; just a year after his separation from Judy, he married Jane Shirley Smith, the couple was together for twenty-three years 1965–88. In 1991, the media mogul married actress Jane Fonda. Their marriage was trailed with several infidelity cases, the actress would later reveal in her 2005 memoir that Ted repeatedly cheated on her with several women. She said she once bashed him on the head with the telephone when she discovered he cheated on her just a month after their wedding. When she couldn’t take it anymore, she filed for a divorce in 2001, walking away with $70 million as a settlement. Ted has five children – three sons (Teddy, Beau, and Rhett) and two daughters (Jennie and Laura). He had Beau, Rhett, and Jennie with Jane Shirley Smith while Teddy and Laura are from his first marriage to Judy Nye.